One of the best ways to promote good behavior is to make a special memory while teaching an important lesson. 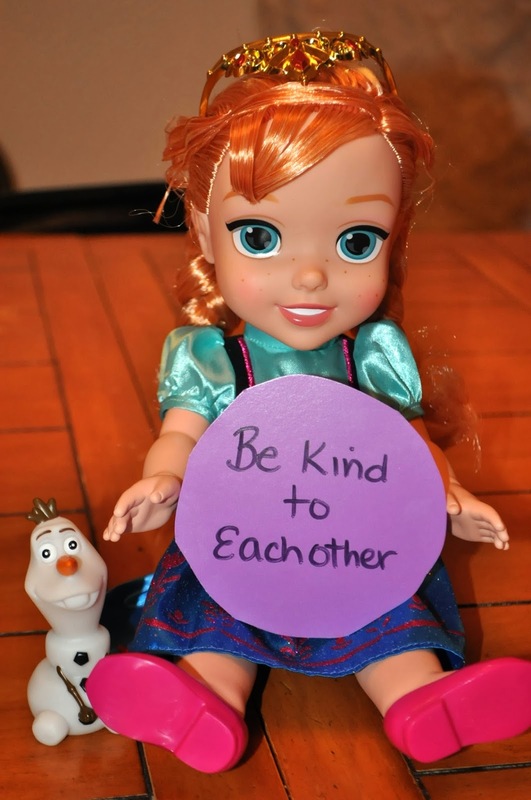 This morning, my daughter, Avalon, and I put on a Kindness Party featuring a few Disney FROZEN toys and an important lesson from the movie. 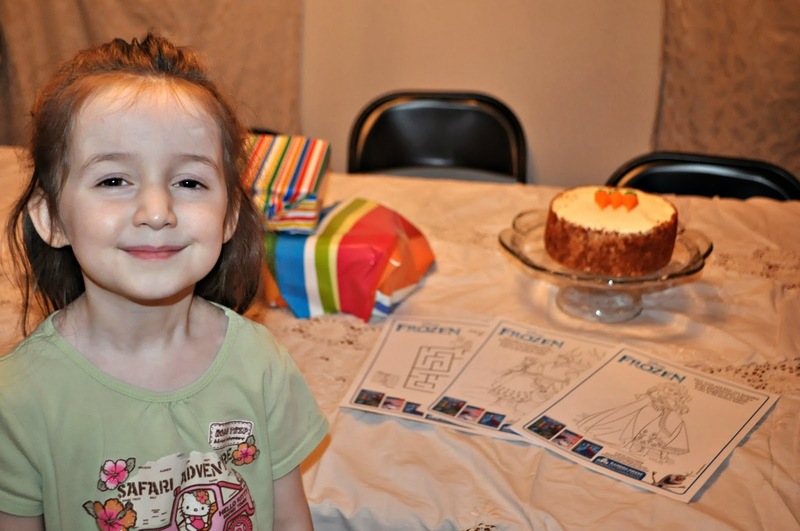 Last night, Avalon and I headed to Walmart, and, on the way, we planned out a fun blessing party that she could put on for her siblings. Our family is really looking forward to seeing the Disney FROZEN movie when it comes out on DVD this spring, so we decided to use that theme for the party. 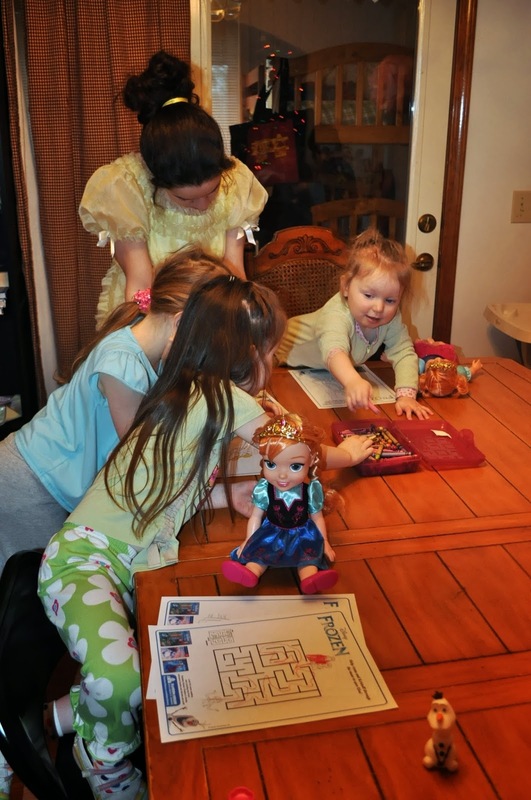 We knew that we wanted to incorporate gift-giving into our party, so Avalon picked out a Toddler Anna doll for herself and a Baby Anna doll for her two year old sister, Kynthia. She also found a FROZEN puzzle for three year old Liam. 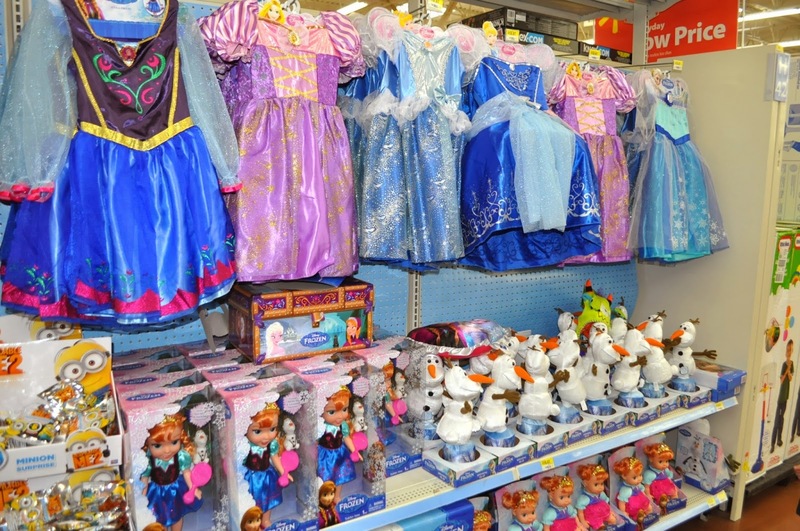 There were a few other cute FROZEN items in the aisle, including dress up clothes and an Olaf toy. 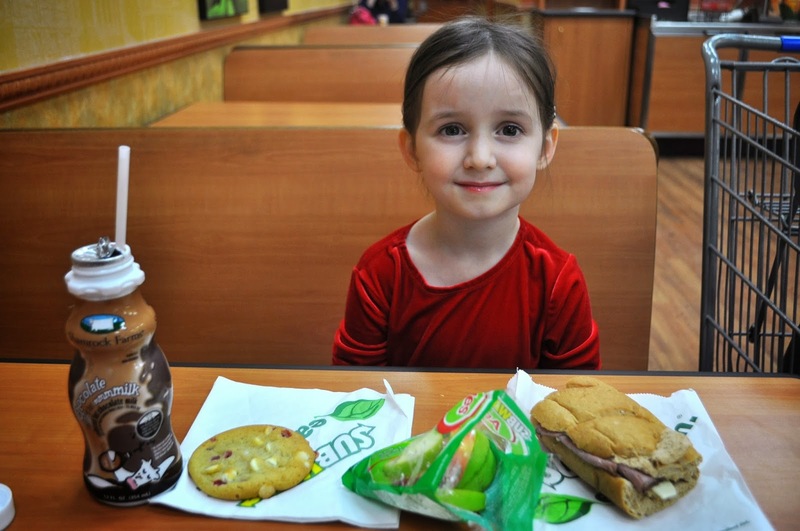 After our shopping trip, we stopped off at the Subway at Walmart. It's so convenient to have one of our favorite restaurants located inside one of our favorite stores! 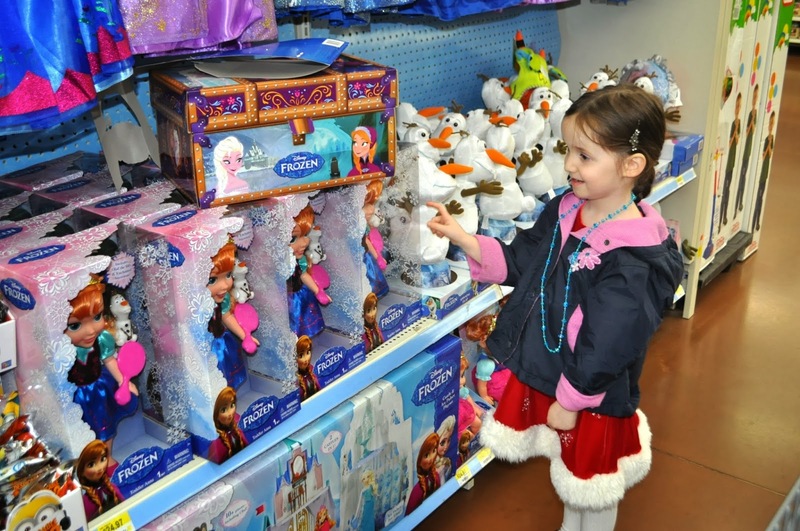 I had heard that Subway was featuring FROZEN merchandise in their Fresh Fit Kids Meal earlier this month, but they were all sold out when we got there. Still, Avalon got a delicious and nutritious meal made up of a roast beef sandwich, apples, and chocolate milk. Neither of us could resist the Raspberry Cheesecake cookies so we bought a couple of them, as well. After a good night's sleep, Avalon woke up bright and early and got dressed in her favorite outfit. She came in my room to tell me she was ready to wrap the gifts she'd bought her brother and sister. She decided to wrap hers as well. After we wrapped the gifts, we headed out to the dining room to set the table pretty for the party. 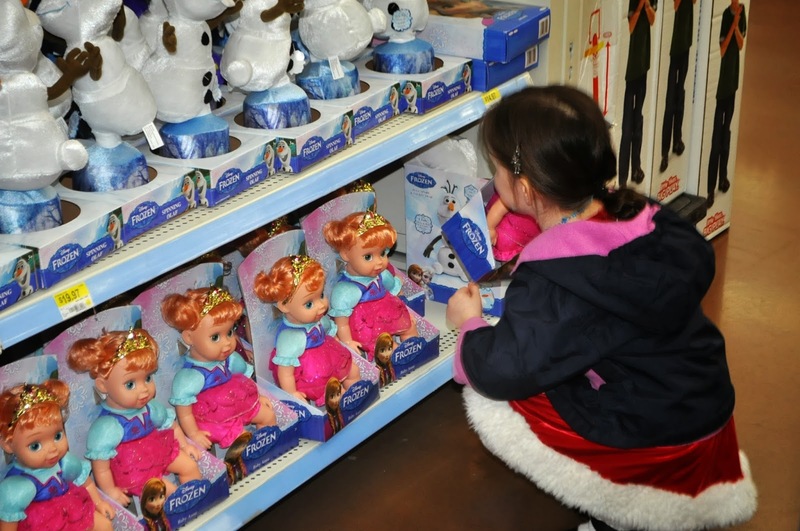 We'd picked out purple and blue for the party colors since they matched the colors we saw on the FROZEN toy packages. Next, it was time to put the cake out! Avalon picked out carrot cake the night before because she liked the little frosting carrots on the top. 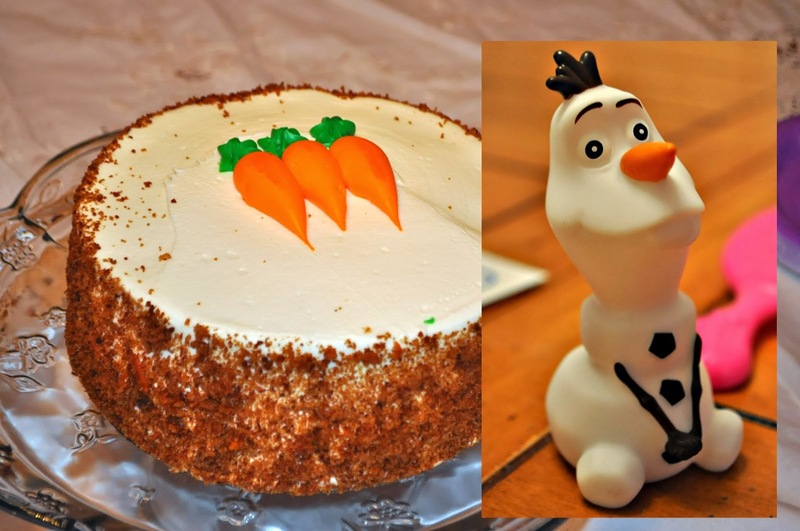 It was a perfect choice as they look just like Olaf's carrot nose! We printed some FROZEN color pages from the Random House website. 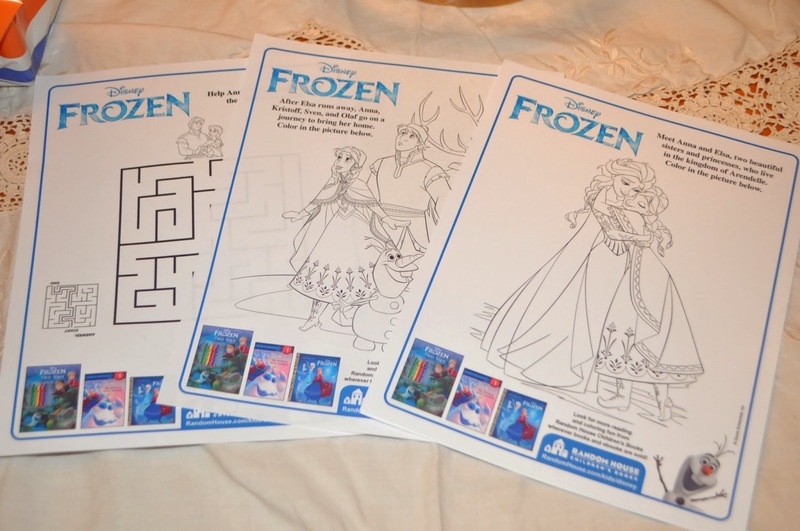 They have several fun games and color pages featuring the FROZEN characters. It's a legitimate place to get printables for lots of your favorite movies and books. After the table was set, it was time to call everyone in. All the brothers and sisters gathered around the table and Avalon welcomed them, explaining why she was putting on the party. She told her siblings how we had talked about the FROZEN movie and the important lessons it teaches about putting others first and loving others. 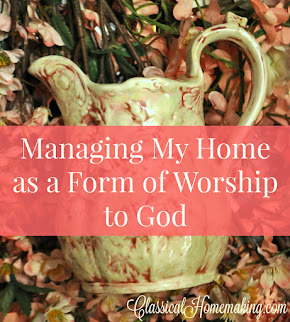 In our home, we look to the Bible for instructions for living. The Bible also teaches us to love others and put them first, as well as to treat one another with kindness. 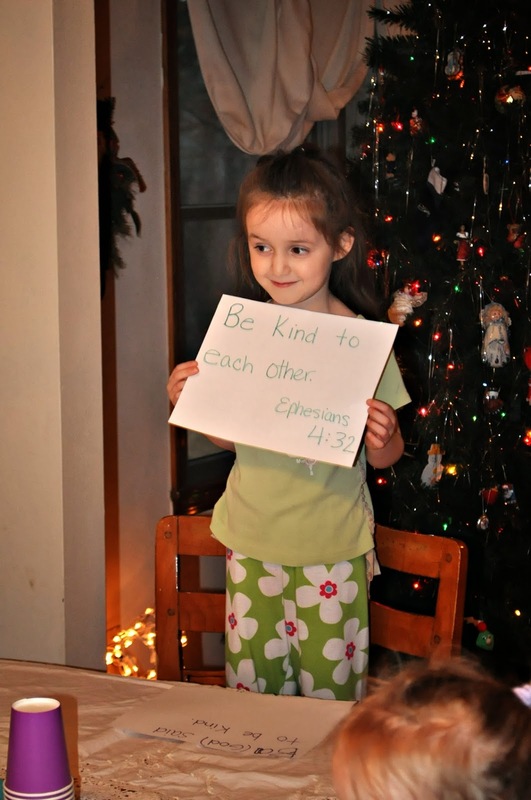 Avalon shared a verse that she learned, "Be kind to each other" from Ephesians 4:32, and all the kids said it with her. We all talked a little more about the importance of putting others first---then it was time to put that thinking into action. 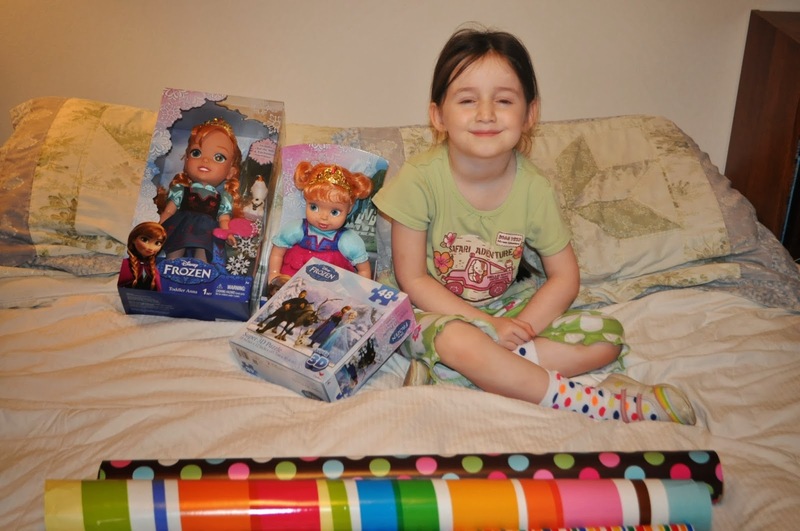 Avalon started by sharing her FROZEN gifts with the two younger kids. 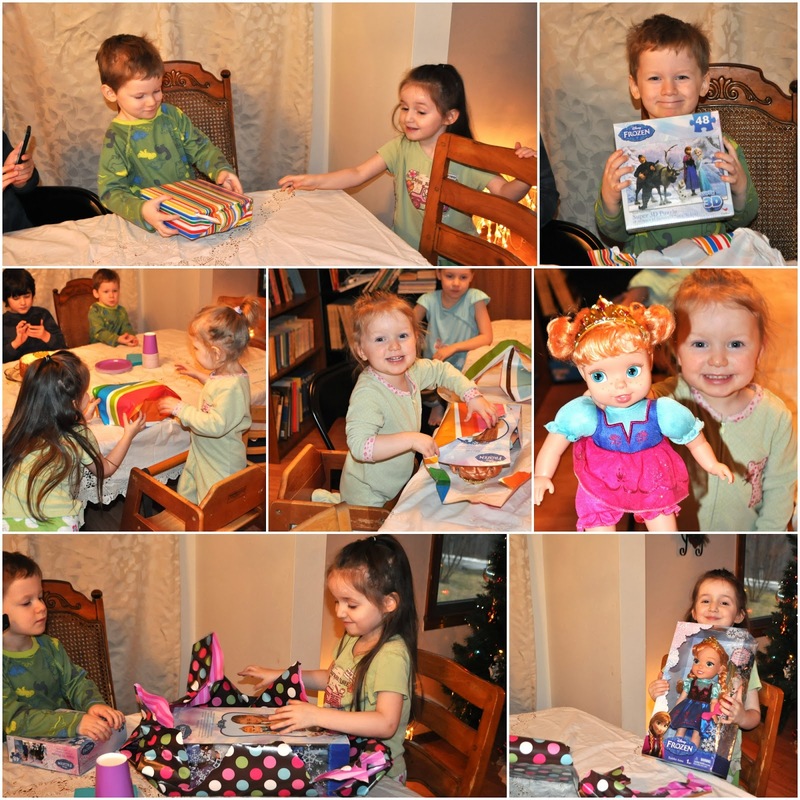 Liam was thrilled with his puzzle and Kynthia adored her new Anna baby doll. Of course, Avalon knew what was in her present, but it was fun to unwrap it just the same. She made sure to tell us that she was going last since she had just learned to put others first! 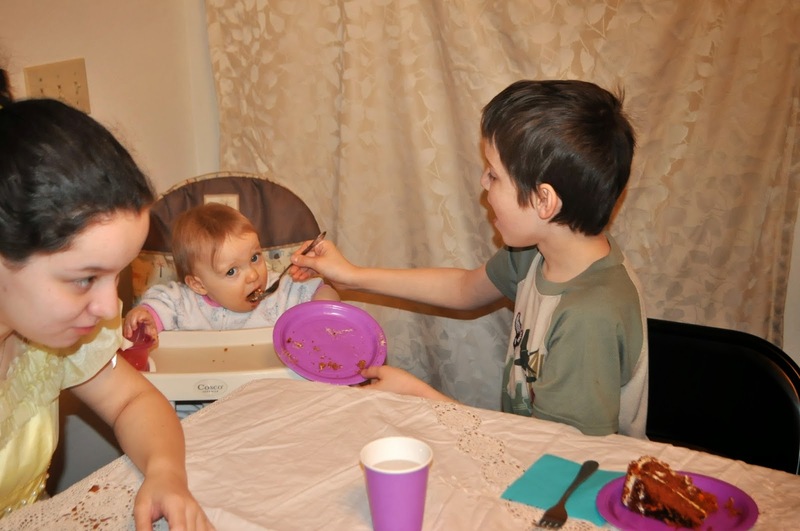 Then, during cake time, I noticed Elisha feeding Brenna her cake. I thought it was pretty sweet that he helped her enjoy hers before he ate his. When the girls were ready to work on their puzzles and color pages, Selah got her crayon box out and said they all could share. That was a thoughtful thing for her to do! 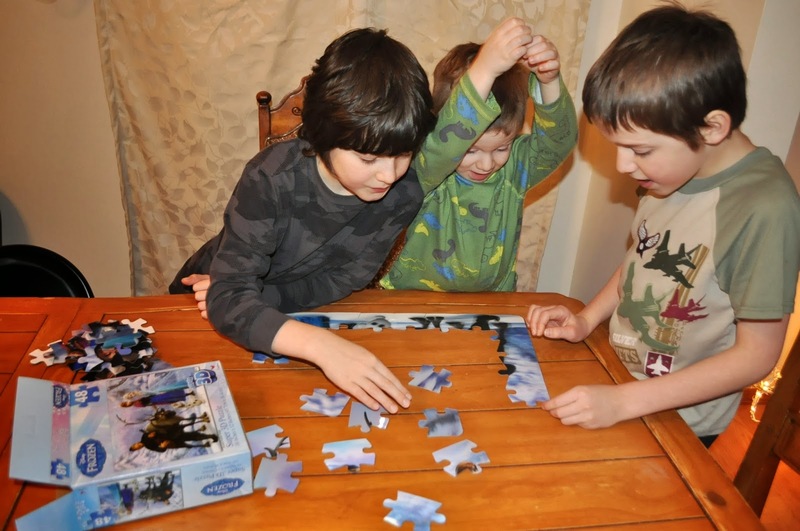 While the girls were coloring at one end of the table, Cainan and Elisha helped Liam put together his new puzzle. In fact, these boys helped Liam put it together several times today! Nothing like a little patience practice, right?! 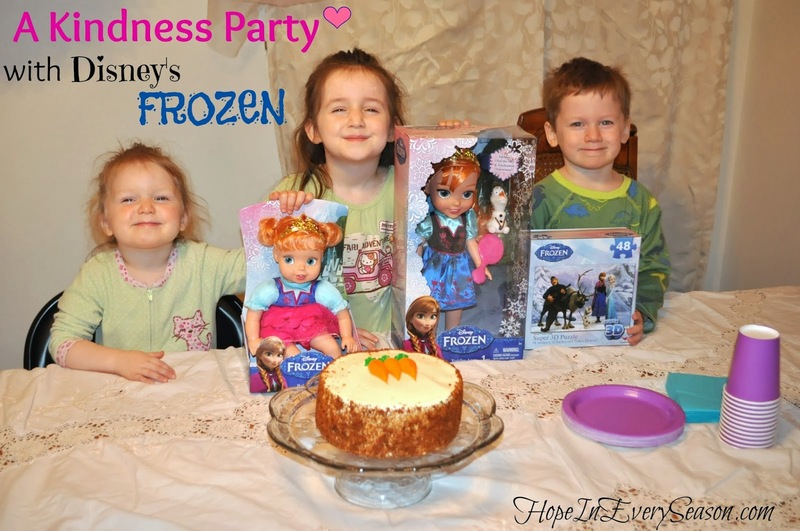 Our Kindness Party turned out better than we'd planned and I was so thankful to have these fun FROZEN themed toys and activities to bless my kids with. Have you seen FROZEN the movie? I can't wait! They will love the movie! My son is already bugging me to go see it again. I'm thinking I might just take a few if I can find it in a theater close by. I really want to see it! They had a lot of fun today---thanks for stopping by! I am smiling so big I can't quit. My face is "frozen" in a smile. Thank you, Sarah! I'm glad you were blessed! What a marvelous way for the children to enjoy a special time. Everyone needs to have a party like this every day. including myself. I am a little short on patience, I enjoyed this post so very much. All the children are so precious and Avalon has such cute expressions. They're all pretty sweet. I'm glad we had the party! 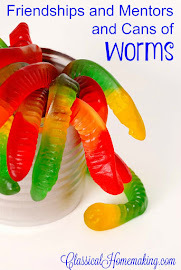 What a fabulous post, I love the idea and will use it with my kids at school. Your little ones are just adorable! I'm excited to see what you do with the idea, Patti! I really love the idea of a kindness party and focusing on others. I've never heard of that idea! It would be a great idea for a classroom like Ivy and Elephants said. 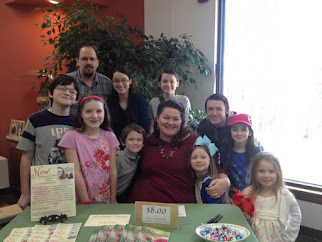 Pinning to my parenting board and stopping by from Family Fun Fridays! Thanks for stopping by! We like to do parties like this to make fun memories, along with a memorable lesson. Let me know if you end up doing one! I love reading about your children. Teaching them to put others first is such a good lesson. 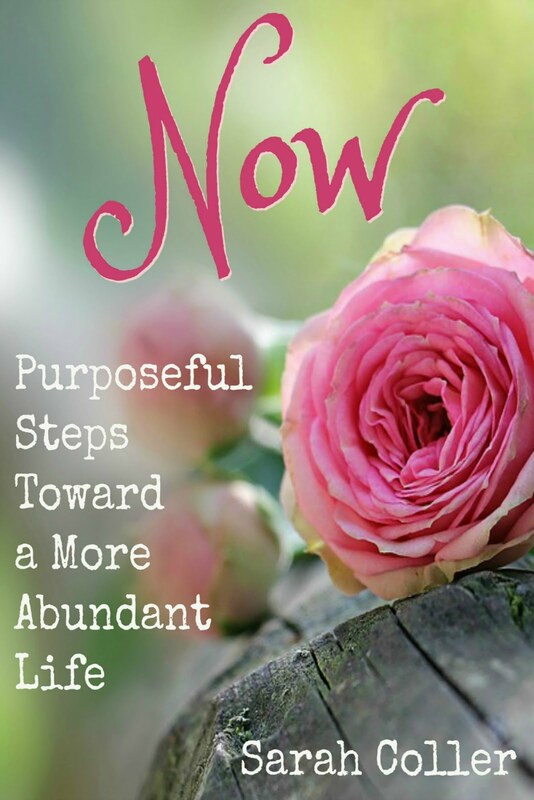 Thanks so much for sharing your link for WholeHearted Wednesdays. Thanks for the encouragement, Judith! What a super sweet party! 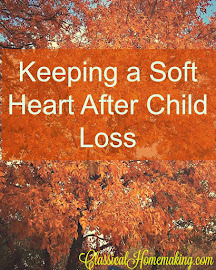 Such a great way to instill kindness in your little ones! 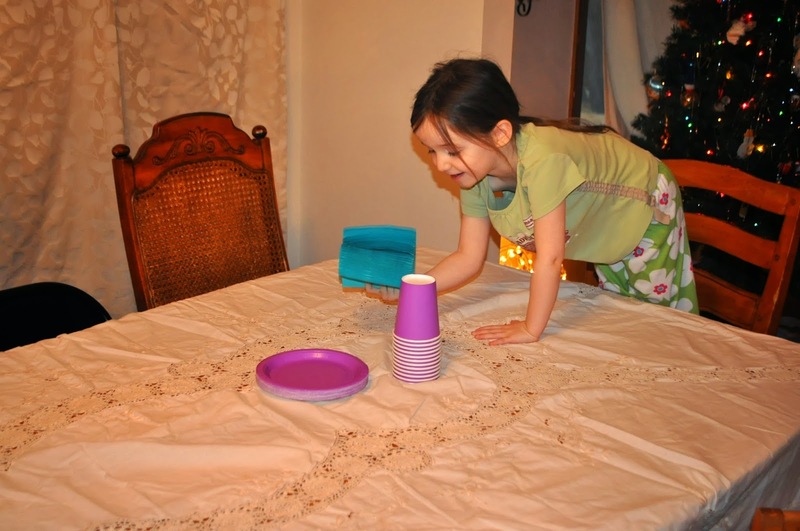 We love to do little parties like this---also a good time to teach manners! What a wonderful and fun way to promote a very important habit! Thanks for sharing with SYC. 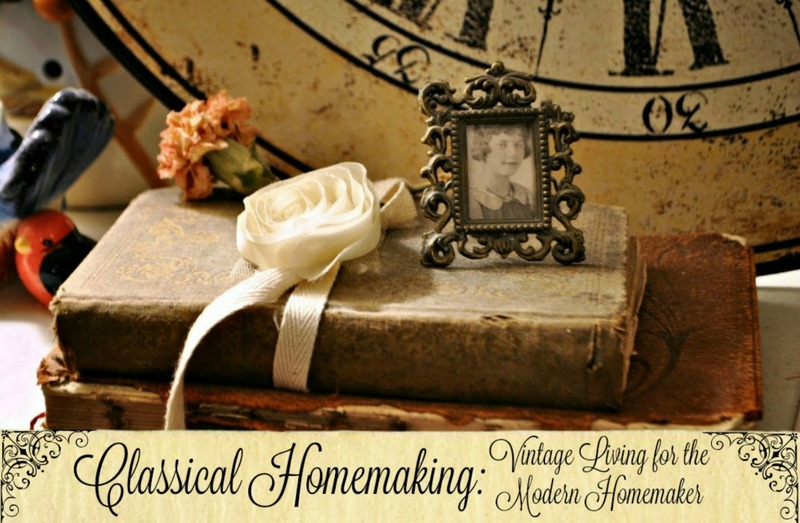 Wonderful and fun post ! You are teaching your children what is most important and making it fun. I love seeing Avalon help you and also the pictures of your other children being kind to one another. This has to make your heart sing. How sweet! Thank you for sharing this with us at the HomeAcre Hop! We hope you'll come back and share with us again tomorrow!